After the beginning of the recombinant DNA era in the mid-1970s, researchers in India started to make use of the new technology to understand the structure of plant genes and regulation of their expression. The outcome started to appear in print in early the 1980s and genes for histones, tubulin, photosynthetic membrane proteins, phototransduction components, organelles and those regulated differentially by developmental and extrinsic signals were sequenced and characterized. Some genes of biotechnological importance like those encoding an interesting seed protein and the enzyme glyoxalase were also isolated. While work on the characterization of genome structure and organization was started quite early, it remained largely focused on the identification of DNA markers and genetic variability. In this context, the work on mustard, rice and wheat is worth mentioning. In the year 2000, India became a member of the international consortium to sequence entire rice genome. Several laboratories have also given attention to regulated expression of plastid and nuclear genes as well as to isolate target-specific promoters or design promoters with improved potential. Simultaneously, transgenic systems for crops like mustard, rice, wheat, cotton, legumes and several vegetables have been established. 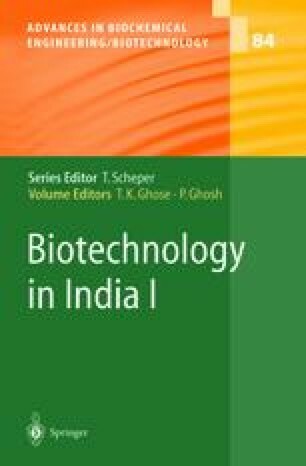 More recently, genes of agronomic importance like those for insect resistance, abiotic stress tolerance, nutritional improvement and male sterility, isolated in India or abroad, have been utilized for raising transgenics for crop improvement. Some of these transgenics have already shown their potential in containment facility or limited field trials conducted under the stipulated guidelines. Plant molecular biology and biotechnology are thus clearly poised to make an impact on research in basic biology and agriculture in the near future.